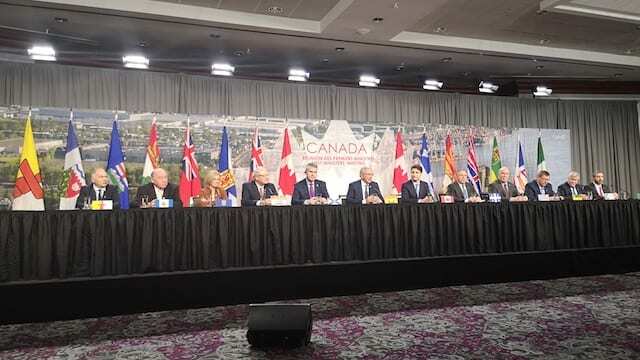 Several premiers united in their message to Justin Trudeau at Friday’s First Ministers Meeting in Montreal: Canada’s economy is in trouble if the provinces can’t get natural resources to market. Amid a stalled Trans Mountain pipeline project, low crude oil prices and pressure on Canada to meet its emissions target under the Paris Accord, the future of Canada’s oil and gas sector is uncertain. The prime minister and Environment and Climate Change Minister Catherine McKenna both said Friday they’re optimistic Canada can meet its climate change goals and maintain economic stability. McKenna heads to Poland this weekend to join the annual global climate talks, where she will reaffirm Canada’s commitment to meeting its 2015 Paris Accord goals. National Inuit, Métis and First Nation leaders, who joined the conference for brief sessions in the morning, offered one solution: include Indigenous peoples. Obed said he also told provincial and federal leaders that Inuit support a carbon tax and other “necessary interventions” into the climate crisis, which has reached dramatic proportions in Canada’s north. While the provinces squabble over emission reduction strategies, Inuit are already seeing a 2.2 degree average increase over historical temperatures. Their way of life has been severely impacted. Sea ice is melting. Country foods are becoming less accessible. Their way of life is threatened. 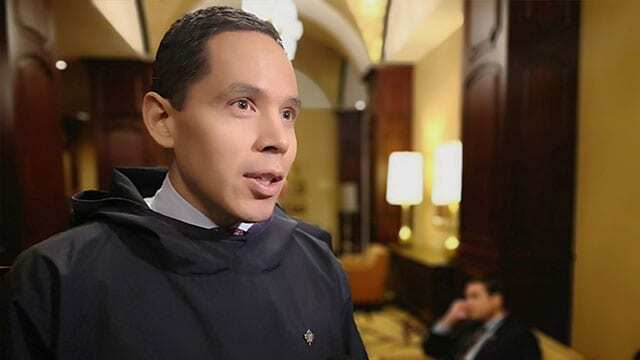 But Obed told APTN News he didn’t just appeal to leaders on moral grounds. He said the continued temperature rise in the Arctic will hurt Canada’s fisheries and other industries. “Premiers and governments are going to have to start thinking differently about how they approach the issue,” he said. 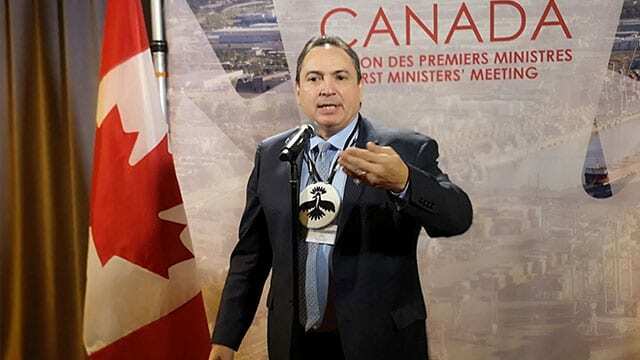 Métis National Council (MNC) President Clément Chartier and Assembly of First Nations National Chief Perry Bellegarde used their 10 minutes each with the premiers to make the the case for bilateral relations with First Nation and Métis leaders in the provinces and territories. “First Nations people are sharing a lot of land and resource wealth, but yet we still see a lot of poverty,” he said. The national chief also said “it just makes economic sense” to avoid pushing Indigenous people to protest and litigation when developing resources on Indigenous lands. 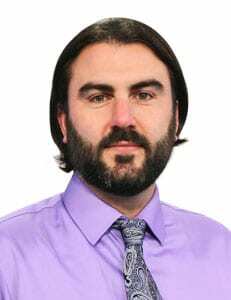 “If you don’t do that you don’t have that respect for rights and title, you don’t have that respect for First Nations jurisdiction, you don’t have respect for duty to consult and accommodate our free, prior and informed consent,” he said. Alberta Premier Rachel Notley said her province’s challenges getting oil and gas to market—in part because of the Trans Mountain pipeline delays and uncertainties—is “the single most important issue” facing Canada’s economy. Amid renewed consultations with First Nations over the project – and low crude oil prices – Notley announced last Sunday the province would reduce oil production by 325,000 barrels per day. Though the MNC supports Trans Mountain and is eager to be a part of oil and gas development, Chartier echoed Bellegarde’s point on the need to include Indigenous peoples over resource development on their land. 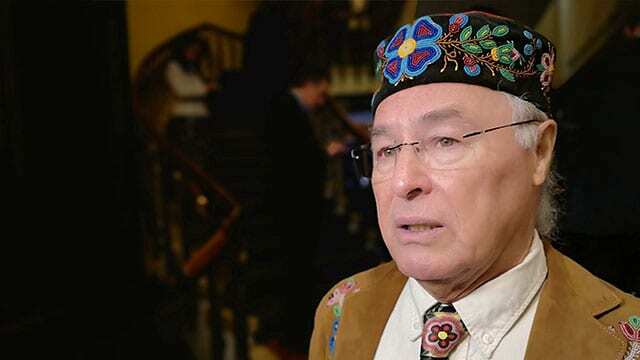 “If they believe firmly that in order to move forward they need to engage us, then they should engage us on an intergovernmental basis,” he told APTN following the meeting. The Liberals’ promised national carbon tax strategy was at the fore of Friday’s meetings between federal and provincial leaders. Ontario Premier Doug Ford, who didn’t join Trudeau and the premiers in their press conference after the meetings, accused the feds of “moving the goalposts” in negotiating emission reduction targets among the provinces. New Brunswick Premier Blaine Higgs and Saskatchewan Premier Scott Moe also oppose the federal government’s carbon pricing plan, which puts a price on pollution. Several premiers also expressed concern with the Liberals’ Bill C-69, which would amend Canada’s Impact Assessment Act and give Indigenous peoples more involvement in the environmental assessment process, which the Liberals maintain reflects Canada’s commitment to the United Nations Declaration on the Rights of Indigenous Peoples (UNDRIP). Bellegarde commended the John Horgan government in B.C. for recently announcing it will co-develop new legislation with First Nations to implement UNDRIP in that province, and its openness to meeting with First Nation leaders. He said the province is a good example of “best practices” in Indigenous relations. “Establish those communications formally and those bilateral relations formally…and let the rights and title holders to have access to those decision-makers at that level,” he said, explaining the advice he gave to premiers. Nothing will change until we have Balanced representation at this table! Almost all white men, people of privilege, 1 woman who points her finger everywhere but back at her own responsibilities to her province! Our governance in this country is so broken, not at all what I consider ‘Leadership’. We could do soooooooooo much better, JT is such a disappointment…..
I’m enroute to eliminate or to resolve the issue of “Climate Change” with modification of my own home, reducing my light and heating bill, substantially, from $3700 to $860/yr. l did more work on the project this year, therefore, it should reduce my hydro bill, further. With a couple ideas in the works, progress toward “Self Sufficient House”, (SSH) will be realized, with excess energy produced from the structure. In ways to utilized this excess energy such as transportation, will affect the fossil fuel scenario by reduction of it’s use, therefore, “Climate Change”, issue will improve substantially, at the same time impacting the job market. Hopefully, the politicians will take notice and undertake this project! As for my Email l would like it to be exposed, if that is possible.